On sale at Powells.com, Amazon.com, and Barnes & Noble. Looks to be another great book from Steve Thornton. A history of the people and made by the people. Also a new walking tour is bound to be loaded with ourstories. This entry was posted on September 11, 2017 by Steve Thornton in Hartford. 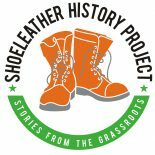 Shoeleather History Project is licensed under a Creative Commons Attribution-NonCommercial-NoDerivatives 4.0 International License.